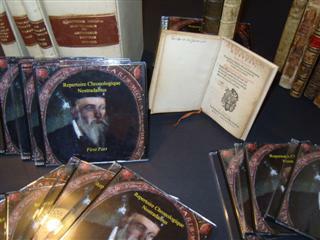 The largest library about Nostradamus for free ! From all the works published on the web and from my personal library I have tried to gather the best material available concerning Nostradamus and everything on prophecies. By clicking on the left-hand menu you can see the pages concerned. In every section you will find a summary of the contents and the links to access the page. It is all free if you have the patience to download it. I'm sorry for the English mistakes you can spot on my web site, unfortunately English is my only fourth language. holders of any images that are not either the author's own, kindly made available to him or already in the public domain. We would be grateful if any whom we have been unable to contact would get in touch with us.